Zemana AntiLogger is a spyware removal software that provide protection against the PC from key loggers, malware, SSL banker trojans, spyware and other activities that may pose a risk to personal privacy information. In addition, Zemana AntiLogger also able to protect username, password, and other sensitive login information to prevents malware or fraudulent websites from stealing the information. On the other hand, Zemana AntiLogger also can protect online communication application in preventing malware from tampering when in the transactions. 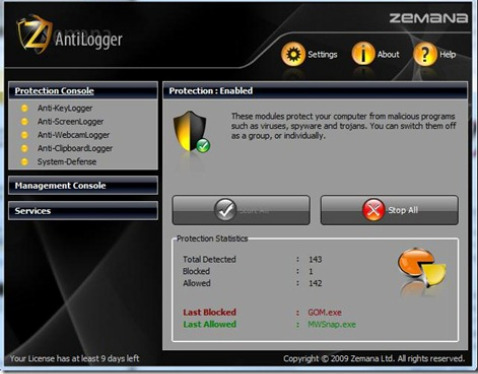 Zemana Antilogger also comes with Anti-SSL Logger, Anti-Webcam Logger, Anti-Key Logger, Anti-Clipboard Logger, and Anti-Screen Logger technology to prevent harmful applications from capturing pictures and images of the computer screen. Provides Secure Internet Banking and Safe Online Shopping. Anti-Webcam Logger that provides protection against Webcam Logger. Protects all screen images with Anti-Screen Logger. Protects keystrokes you enter with Anti-Key Logger Module. Protects all operations that use SSL protocol. System Defence Module that protects your system. Actively monitor and shut down keyloggers,SSL banker trojans, spyware, and other malware. Zemana AntiLogger normally cost $34.99 for purchase. As part of promotional offer from PC Welt, now everybody can grab 1 years Zemana AntiLogger 1.9.2 license for free by follow the step below. An email will be sent to the registered email address with a license key or activation code in it for Zemana AntiLogger 1.9.2. The license code is actually the same for each and every people who requests it, which is 72C8-284B-5A83-5E2F. Zemana AntiLogger 1.9.2 supports Windows XP, Windows Vista, and Windows 7. Update: New free Zemana AntiLogger giveaway.